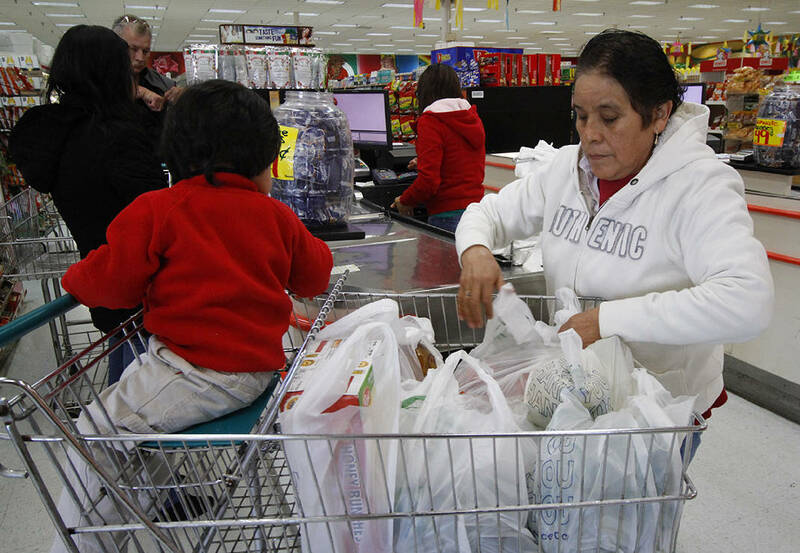 Staff file photo / Belen Gembe, her son Joel Gembe and her mother Elena Capiz, from left, pay for and bag their groceries while at the Delray Fresh Market in Dalton, Ga., on Thursday, November 20, 2014. A proposed state law would make it illegal for municipalities to regulate auxiliary devices, such as plastic bags. Tennessee's bill to outlaw communities from creating legislation to reduce single-use waste is quickly making its way through both the state House and Senate after being widely approved by two committees on either side of the State Legislature. The Tennessee House Consumer and Human Resources Committee overwhelmingly approved an amended House Bill 1021 on Monday— which makes it illegal for cities to regulate, prohibit or charge fee for auxiliary devices: bags, cups, bottles, straws, to-go boxes, delivery packaging and more — pushing it through to the calendar and rules committee. Its adjoining Senate bill, 431, was then approved by Senate State and Local Government Committee Tuesday morning and will now go to the Senate floor in the next two weeks. "Cities and counties in other states nationwide are issuing ordinances that ban certain types of plastic straws and bags and creating a patchwork of regulations," bill sponsor state Rep. Susan Lynn, R-Mount Juliet said. "What this bill says is that these decisions will be left to the state." Lynn has taken lead on the bill with Mike Bell, R—Riceville, sponsoring the adjoining Senate bill. Lynn argues city regulations on such items are confusing and a direct affront to small businesses. Bell wants to see legislation for such items made at the state-level, in line with how Tennessee has handled other regulations on items such as firearms, smoking and labor laws. The bill is being passed as an amendment to a totally unrelated bill, which pertains to county district boundary maps. The amendment will replace the unrelated placeholder, which legislators filed because they hadn't finalized language before filing deadline. The amendment was brought before the committee during last week's meeting but was delayed to address concerns about unintended consequences pertaining to food trucks, recycling programs and more. The new amendment approved this week will replace the old attachment and includes language to ensure the bill does not restrict recycling programs; impact the ability to regulate programs at concerts; impact building and zoning codes; supersede state law for vendors; remove restaurant privilege tax; and ensures food trucks won't be impacted. "I think the fact that we've had so many questions and amendments is because this bill does way more than what I think you were thinking it would do originally," Freeman said to Lynn. "And a lot of the decisions we've been addressing here are ones that have been handled appropriately on the local level." The bill has been met with sharp criticism from conservation organizations who believe cities should be taking steps to reduce pollution. The Tennessee chapter of the Sierra Club has circulated informational sheets urging citizens to reach out to their Congressmen. "Single use plastics clog our stormwater systems, pollute our waterways, kill wildlife and eventually result in microplastics in our water system," according to the message. "Local communities know best how to handle their unique challenges with single-use plastics, and unless the state wants to enact a ban across Tennessee, the General Assembly should stay out of their way." Lynn has continued to state the bill's purpose is to ensure municipalities don't create a "confusing patchwork" of legislation. She argues any decisions should be made at the state level but has regularly voiced her displeasure of such bills. She has called single-use plastics a necessity, said banning straws creates both a health risk and an attack on freedom, and argued that plastic bags are needed because they are convenient. Her bill is supported by the beverage industry, grocers and others, she said. The committees conducted voice votes, with the "ayes" overwhelmingly winning. For the second straight committee meeting, Reps. Bob Freeman, D-Nashville, and Dwayne Thompson, D-Cordova, spoke against the bill while Mike Sparks, R-Smyrna, defended it in the House. There were two "nay" votes in the Senate, coming from Democratic and Republican lawmakers from Nashville. "You talked about uniformity, and I want to bring up that we don't have uniformity across our state," Freeman said. "We have different signage regulations, different aesthetics regulations, different parking requirements. Places like Pigeon Forge are very different and have different regulations. Where do you think we draw the line?" Lynn pointed to labor and worker safety regulations, citing they are often uniform across the state. However, Thompson believes this is an entirely different situation. "I'm fundamentally against the whole premise of the bill," he said. "I know that a lot of [labor] related laws are uniform and should be uniform across the state; criminal laws should be uniform across the state but we're a patchwork of counties and cities. We're a lot different. We need more latitude, especially in laws regarding environmental problems."